The eSports industry has been growing at an explosive rate, and League of Legends (LoL) is one of the most popular competitive games out there. This year the League of Legends World Finals had over 36 million viewers, with a prize pool of over 2 million dollars. That kind of viewership surpasses the NBA Finals and the World Series, some of the largest sporting events in the world. League of Legends was released about 7 years ago. I first started playing in the summer of 2010 and was instantly hooked. The game featured a special combination of engaging combat, fun team elements, and the ability to play a match quickly. When I first started playing, there were only about 50 champions available to play. Since then Riot Games, the makers of League of Legends, grew the roster to over 140. Whenever a new champion came out, I had to see how it played. I couldn’t get enough—and I quickly reached level 30. At level 30, you can begin playing ranked matches, and then the fun really starts. Just like in traditional sports, in each LoL season players start over to compete against other players for the highest ranking. Every season offers new changes to the game, bringing players back for more every year. There are seven different tiers, and each tier has several divisions. From lowest to highest, the tiers are bronze, silver, gold, platinum, diamond, master, and challenger. Each tier rewards special in-game items like new looks for champions and special icons for your account. Of course I needed these items to show off to my teammates. For the past few seasons, I made it to the gold tier by the time the season ended. This year was a bit more challenging, since I had not been practicing as much as I had in previous years. Once the dust had settled and my placement matches were over, I was put into the Silver 3 division. I was hoping for better, but it was just a starting point. I knew with a bit of work I could get myself to a higher rank. I immediately jumped in and played more games to see if I could get my rank higher with a little practice. I started to grind away, but I was getting nowhere. After a string of losses, I found myself dropped down a division to Silver 4, and this made me think, there’s got to be more I could do to improve. My first stop was to check out Lolking, a website used to help players find the best way to level up and build their champions while playing. These guides are developed by high-rated players in the community. I started to look at guides from the champions I played most, one of them being Lux. The first thing I noticed was some of the highest rated guides used different runes and masteries than I had been using. They went into detailed explanations as to why they chose them, which made it a bit easier for me to understand the reasoning for the changes I should be making. Another extremely useful feature that Lolking provides is stat tracking; they pull data from every game that is played. They can see every champion picked in every game, and know which items each champion takes. 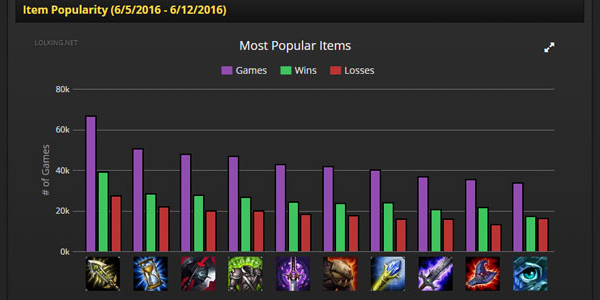 In addition, Lolking tracks win rates and how often champions get banned. In baseball, coaches and analysts look at a number of factors to measure a player’s impact on the game, including batting average, on-base percentage, or run rate. These stats help teams make smart, informed decisions by seeing what works or doesn’t work. In League of Legends, stats play a similar role, especially since it’s a game that’s always changing. Champions who performed well last season may have had their damage or health reduced and are now weaker. What Do You Mean I Need to Trade? Doing positive trades directly impacted my win percentage and therefore helped my rankings rise. 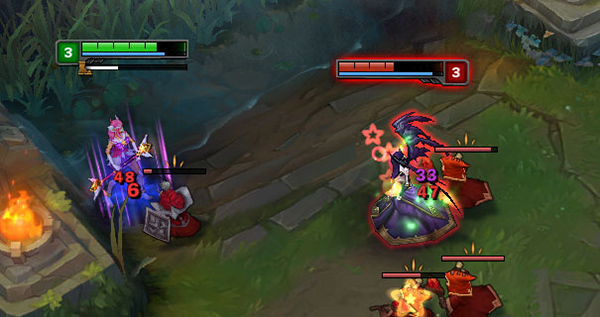 In LoL, a trade is when you and your opponent do something to each other, such as dealing damage. In this instance, your trade would be positive if you damage the opponent more than they can damage you. You might do this by getting off two auto attacks while they only get to hit you once. Another extremely useful feature of the Lolking guide were videos showing off the best ways to use your different skills, kind of like sports highlights. This included videos on how to make positive trades in your favor. Getting better with my most-played champion was only the tip of the iceberg. I needed to learn how to play a few other positions and improve my ability to play a variety of champions. Skillfully playing multiple champions increases your ability to win in the same way that a having a variety of hitters with different skillsets would increase a baseball team’s chance of getting on base. League of Legends is one giant game of decision making, and starts well before you even get into the game. To get an advantage over the person I was going to be facing, I had to learn new champions. This meant reviewing their abilities, and looking up guides to play them well. The final piece of the puzzle was to practice, and often. Just like any sport or instrument, the only way to get better is to put in the time. I bet you might be asking, what is there to practice when playing League of Legends? One super important skill to have is the ability to last hit a minion. When you score the last hit on a minion, you are given bonus gold that is used to buy items. A common mistake that many players do is not achieving the maximum number of last hits possible. This could leave you at a serious disadvantage against your opponent. There are a few benchmarks when it comes to how many minions you kill. Many professional players say you should be able to get 80 minion kills in the first 10 minutes of the game to be able to compete at a high level. They recommend playing practice games against bots in order to improve your last hitting skills, so that’s exactly what I did. After repeating this challenge many times over several days, I saw a noticeable improvement. This really helped me improve my chances of winning my games. Now I’m currently in the Silver 1 division and quickly approaching the Gold tier. With a bit more hard work and practice, I know I’ll be able to reach it soon. Achieving the gold rank will open up a bunch more rewards that aren’t available if you only finish silver. In improving my LoL ranking, I learned a lot, including how much content out there is related to getting better at League of Legends. To rank up, I needed to have patience and keep myself motivated to continue researching and improving myself. The biggest takeaway was getting better isn’t an overnight process. It takes time, and you really need to put the work in to see the improvements. Who knows, maybe this time next year I’ll be able to play on one of the big eSports teams like Evil Geniuses. They have earned more than $12 million in eSports tournaments! Is your child ready to take their League of Legends prowess to the next level? Our brand new course helps teens develop the core mechanics, mental discipline, tactical know-how, and critical thinking necessary to climb the ranks in one of the most competitive eSports games—League of Legends. 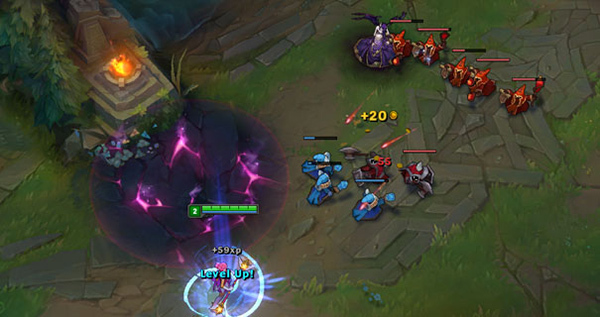 League of Legends is one of the most lucrative eSports games. Join us this summer at UCLA, Stanford, or NYU and let your gameplay advance to the next level.